I’m sure you’ve all seen those horrible fat-shaming ads from Georgia, USA advocating the bullying of fat kids. If you haven’t, have a look on Heather’s post at Fat Girl Posing (because I’ll be damned if I’m giving that campaign any link love). It’s disgusting that anyone thinks that this kind of public shaming and bullying is acceptable. How this campaign could possibly be called “Strong 4 Life” – I have no idea. Since when did shaming and bullying people make them strong? I know what it will do for life for these kids – because I was a fat kid too. It will be SHAME for life. Low self worth for life. Bullying for life. Avoiding medical care for life. Hating yourself for life. It will not be strong, happy, healthy, empowered for life if we allow this to continue. Well I’m happy to say that we’re not just letting this one slide. A whole lot of fat activists have taken up the sword and are fighting this one in a whole lot of ways. There is a website, called Stand 4 Kids, which is directly in response to the campaign, and is aggregating a lot of information on the campaign and ways to combat the shaming and bullying. There is a petition on change.org that you can sign to demand the end to weight stigma and the cessation of this campaign. There is a facebook group you can request to join, to get information and share news on how to combat this horrible campaign. How fabulous is that? There are a whole bunch of them, from fat activists of all shapes, sizes and walks of life. Many of them you’ll find on Marilyn’s Tumblr. Seriously – how awesome are these? What fantastic messages to send out to ALL people about their bodies and optimising their health. Well, you know, I couldn’t let this fantastic campaign go by without contributing myself. So I sent Marilyn a photo and a statement, and she made one for me! I’m totally chuffed with it. I really wanted something joyous and happy – since those images from Strong 4 Life are so miserable and shamed. I want people to find joy in their lives and joy in their bodies. So, will you all stand with us? 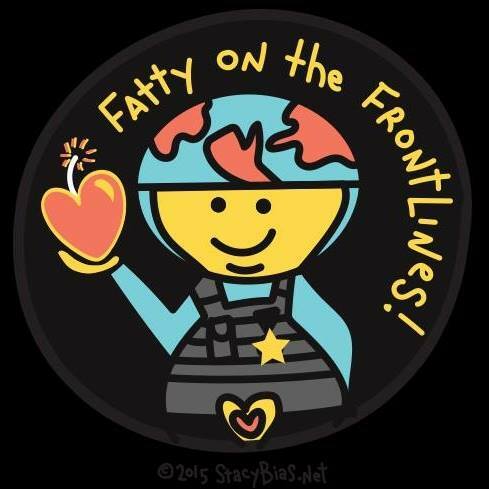 Will you join us in standing against fat stigma and body shaming, especially for kids? No matter how you choose to participate, every action helps and is welcome. We can and ARE making a difference. That is amazing! Good on you! fantastic! and I will stand with you. Yay, Kath! So glad to see yours! So far, I’ve signed the petition and written an article encouraging others to stand against that campaign… and I have to wait for saturday before I have my bully pulpit back again, since I’m the weekend editor at Big Girl. But you can bet your bottom dollar I’m standing with you and will encourage others to continue (or start) to do so. I love these posters! I may have to get my photograph taken and come up with a pithy message, myself. Yay Twistie! Any action is valuable and welcome! I hope you will get a poster made too. Several of my family members are overweight (including myself as a smaller fat) and although my boyfriend is thin, a lot of his family members are larger as well. There is a good chance that my children could be overweight. I will be damned if my children, especially my daughters, are going to be bullied into eating disorders and low self-esteem like I was. Although my child isn’t even alive yet, I thank you fabulous women (and likely men) who are involved in this campaign – even from across the pond and thousands of miles away! Congratulations Clara – best of wishes for the move and the new baby. Here’s hoping that we can all work together and change things so that your babies never have to experience this kind of fat hatred and shaming. Your poster is AWESOME. It should be up in schools. And doctors’ waiting rooms. And supermarkets. Basically, everywhere where people need to be reminded of the existence of terrifyingly happy fat people. Thank you – I hope you’ve seen the Tumblr with all the examples – there are so many now. We should have them up everywhere! I might print some out and bomb my city with them. This is excellent! And it strikes me that fatness isn’t the only radical thing about these posters. If only we could see images of normal human beings in all their varied beauty on posters and in the media, instead of an ideal that is so unrealistic even models have to be drastically photoshopped to conform! It’s only as I’ve grown older that I’ve learned to notice how beautiful people of all shapes, sizes and ages actually are! The media doesn’t want us to find that out, so it brainwashes us with a constant stream of pictures designed to increase our insecurity and make us spend time and money chasing this impossible fake image. Think what we could achieve if we let go of that, and had more time and energy to focus on stuff that matters! I’m not saying we shouldn’t dress nicely and wear make-up, but we should do it for ourselves, to complement our own individual beauty, and be proud of the result! In this area, Kath, you are a true inspiration! I’m horrified by the originals (of the children). Why do they pay so little attention to what affect these visual campaigns may have upon the children themselves? It doesn’t take an effort of genius to work it out. And a little off topic: just what is this body size hysteria truly in aid of? I know that we have been over this question before, but I’m still at a loss as to figuring out what they hope to ultimately achieve. Like if an entire nation all slimmed down to one, uniformly accepted size all the worlds f$%king problems/health risks would suddenly disappear. Yeh. Sure. The cynical answer: It’s easier to focus on shaming, bullying, and ostracizing fat people and denying them medical care. It’s much easier than addressing the real problems: no playgrounds in many neighborhoods, modern educational fads denying recess time to children, food containers that leak cancer-causing chemicals (okay, that was addressed–sort of), family providers working like dogs and sacrificing sleep and exercise just to stay afloat, bad air in the city, bad water in the country, bad grocery stores in the inner city, pesticides all over the place, and so on. The cynical elaboration on this cynical answer is that really ending any of these problems would require either somebody up the food chain not making lots and lots of money anymore or a whole bunch of Joe Q. Average people paying a little more–or (gasp, pearlclutch) those people getting benefits they did not pay for.